First of all, thanks and congratulations to all the people in MW101. I think this is in the top 3 (#1) of the MW resources out there!! 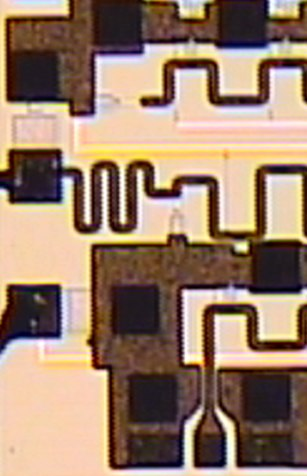 I've designed and fabricated my forst version of a 1 to 40GHz DA MMIC (GaN on Si), with 20dB gain and Pout >1W P1dB for the whole bandwidth (hopefuly). Input and output match is good, gain is decent (some 17-18dB, with Vgs-s still to be tuned due to differences in Vth and Idss from EM simulation to measurements) and I still have to measure Pout. 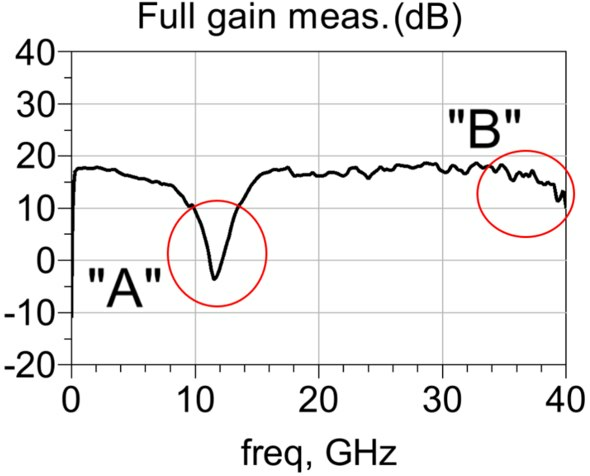 BUT, There's a naughty absorption in my S21 measurement around 12GHz (the "A" dip in the first picture). My amplifier consists of 2 series connected cascode DA stages, one for gain and the second for power. I've checked in EM simulation that this effect is due to my first stage being loaded by the DC bias external circuitry (drain bias is applied to both sides of the drain line of stage #1, second picture). I just ran over your post today and I want to share my results as well. In fact, you were right on the dip at around 10-ish GHz. I have seen many papers reported this effect. I have designed several DAs and use very simple single wire bias choke since I didn't care about what's going on below 20GHz. You can see that I also have that dip at 10GHz. 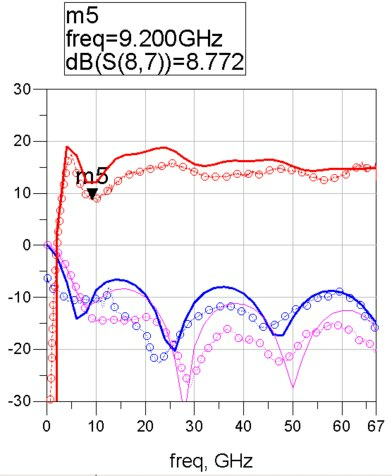 There's a paper out there claiming that they use a structure of high Z line - spiral inductor - high Z line, that can create a very good RF choke. But I can't pull out which paper it was at the moment. I will try and keep you posted. Otherwise, if your chip consumes not >150mA, there's off-chip RF choke out there that can handle upto 50GHz for a pricey cost. It would be great if you can share a way if you figure it out. I am also interested in this.